An unexpected chat with Sir Steve Redgrave. On Saturday afternoon, 19th September, Patricia and I went to Marlow as that evening we were booked in at the Compleat Angler for a meal. Marlow Rowing club is close by so before having a riverside stroll we visited the club They have a brand new boathouse which had been officially opened by Sir Steve earlier that day. We were given a tour of the new facilities, most impressive, and then taken to the bar where we had a drink. Sir Steve was close by and I asked him whether he liked The Radleys of Lea book. I showed him a copy and he said the copy Katrina Robinson at the Regatta headquarters was meant to have given him must have been put in the wrong place as he hadn’t seen it before. He then looked through it and spoke about his memories of Springhill, mentioned Graham Hill and Sid Rand and he recognised the Radley bungalow from the pic in the book. He took away the book and said he would ask Katrina to look for the other copy. Patricia also got to have a chat with him. We showed him the part about Simon Boyde rowing at Henley in the double sculls an event won by a crew containing a young Sir Steve in 1992. Sir Steve said he was 20 at the time and asked me how old I was and said I was wearing better than him which I don’t think is true. This book is a good example of the positive side of the self-publishing industry. In earlier days a niche publisher would have snapped it up. Now there are almost none left and family histories like this fall by the wayside unless individuals are prepared to take the risk and publish themselves. 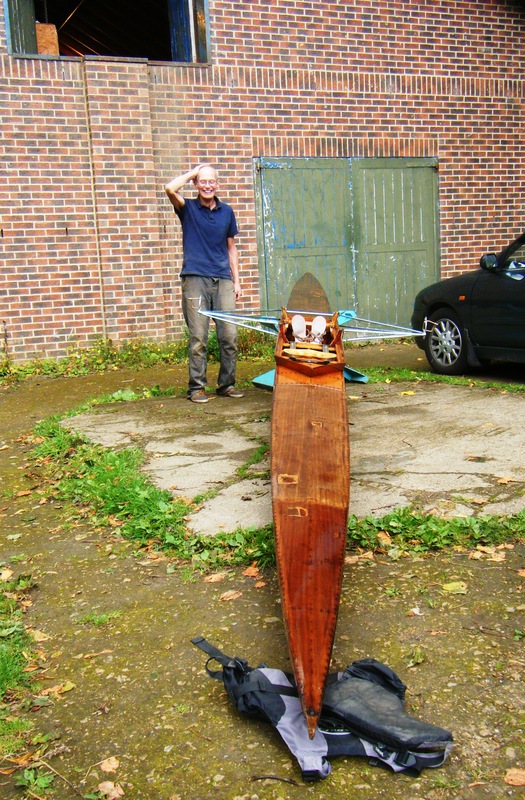 Clive Radley, a nephew of the College’s first ever boatman Laurie Radley, decided to take the chance having for years been fascinated by the story of one of the leading boatbuilding families in East London. V. Radley & Sons eventually went out of business in 1970 but even now examples of the company’s craftsmanship and skill exist in places as far apart as Hong Kong and Hexham. In our era the river Lea is in the shadow of Olympic Park. From 1850-1950 it was at the artery of a large industrial community. As many as 150 rowing clubs lined its banks and competition was intense. 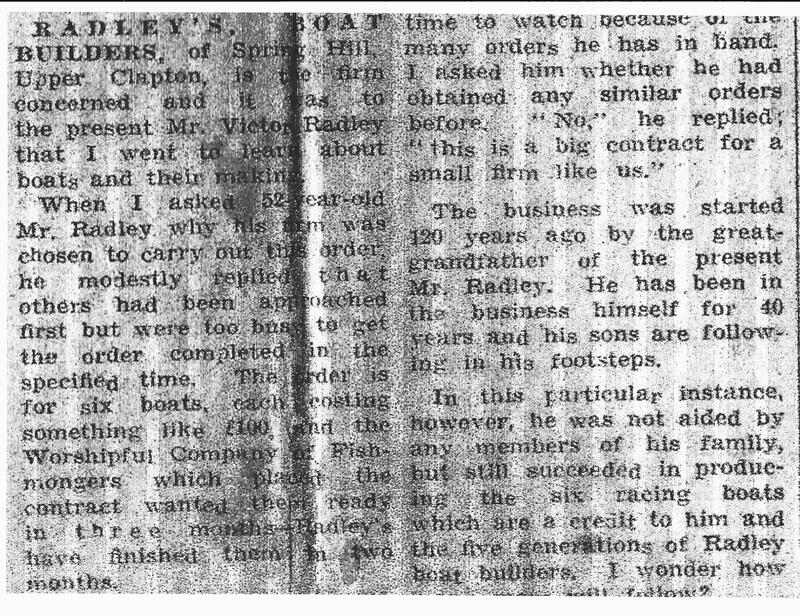 The Radley family began hiring out boats in 1840 and branched into boatbuilding 15 years later. Laurie was born in 1906. An unpublished memoir he wrote when he was 84 about his early years on the Lea can be found today in the River & Rowing Museum at Henley. From an early age Laurie helped with the construction of clinker pleasure skiffs and other boats. In his teens he emerged as a skilful oarsman and often rowed competitively in a 1V with his brothers. Until 1928 he worked in the family business but then married and left for a job at a timber merchants. During the Second World War he was a policeman. After the war he was appointed waterman at the Pengwern Boat Club in Shrewsbury. 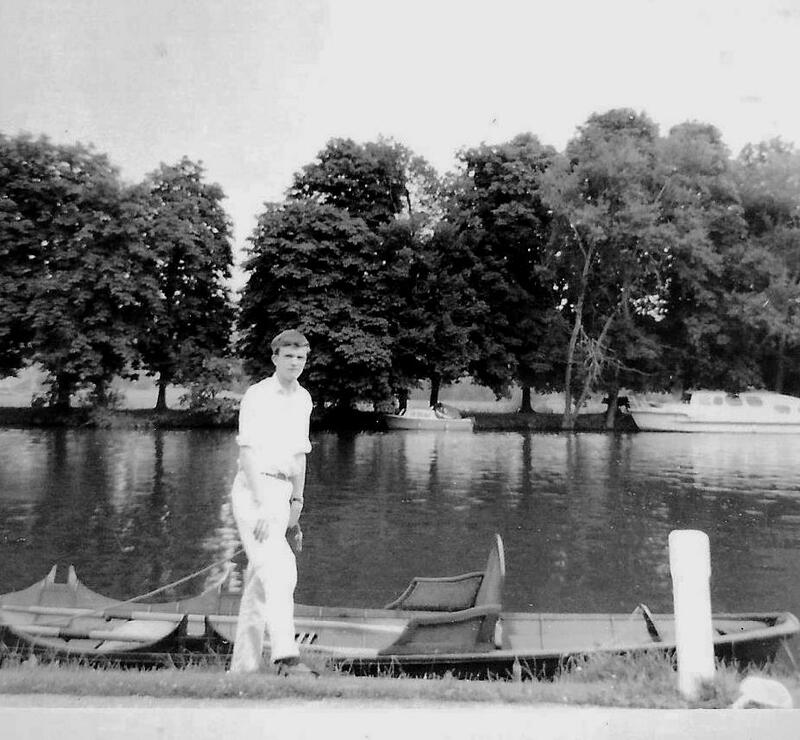 Two things seem to have lured him south to the Nautical College in 1955 – the chance to be in at the start of rowing at a school; and the promise of spacious living quarters in a flat above a boathouse by the “idyllic” Thames. For the next 20 years Laurie Radley, as an obituary written after his death in 1992 by Peter Politzer (and republished in the book) underlines, was central to the development of “fine rowing” at Pangbourne. Modest, resourceful and reliable, many fine College rowers of the period owe him a debt of gratitude. IN 1960 HOW DID A WOODEN SCULLER BUILT BY SID RADLEY ON THE LEA IN NE LONDON BECOME THE J HOPPER AT HEXAM BOAT CLUB 300 MILES AWAY? 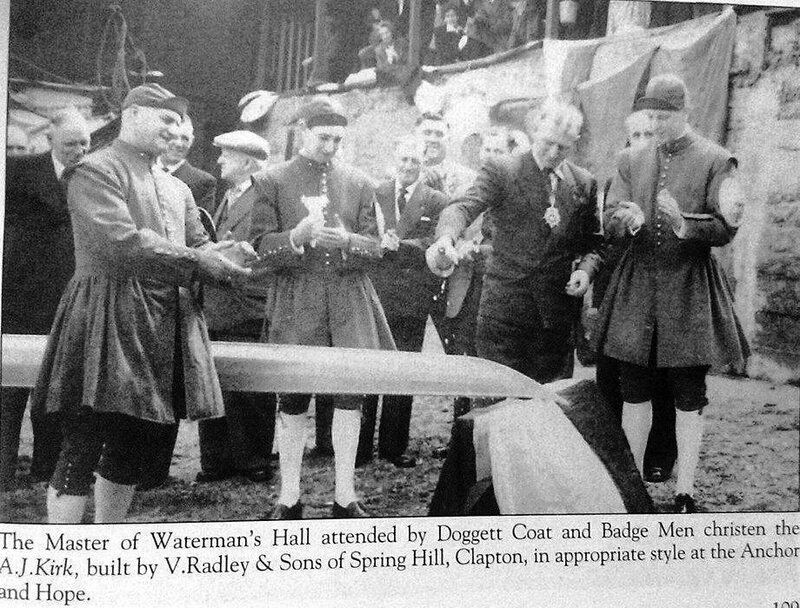 Source: IN 1960 HOW DID A WOODEN SCULLER BUILT BY SID RADLEY ON THE LEA IN NE LONDON BECOME THE J HOPPER AT HEXAM BOAT CLUB 300 MILES AWAY? 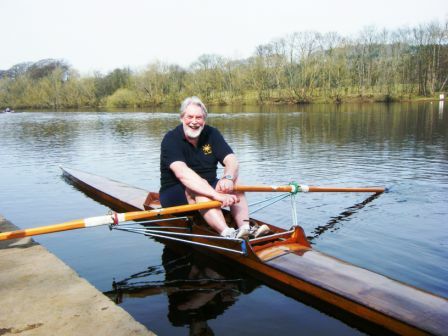 In late 2012 Roger Bean, purchased the J. Hopper, a dilapidated single clinker scull in poor condition, from Hexham Rowing Club. The J. Hopper had the builder’s plaque, V. Radley and Sons Springhill, and he had traced me via Chris Dodd at the Rowing & Regatta Museum. Roger asked me who had built the J. Hopper, and approximately when. I emailed back that Sid Radley had almost certainly built the J. Hopper in the early 1950s at the Radley Springhill boatyard, although the name J. Hopper may have been added after delivery. 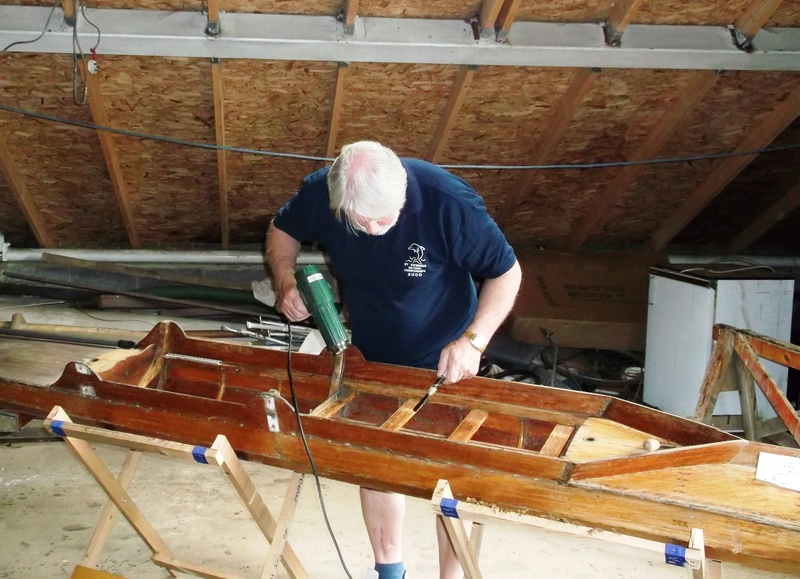 Roger Bean had no previous experience of boat renovation but he intended to repair and restore the J. Hopper to a condition suitable for sculling. 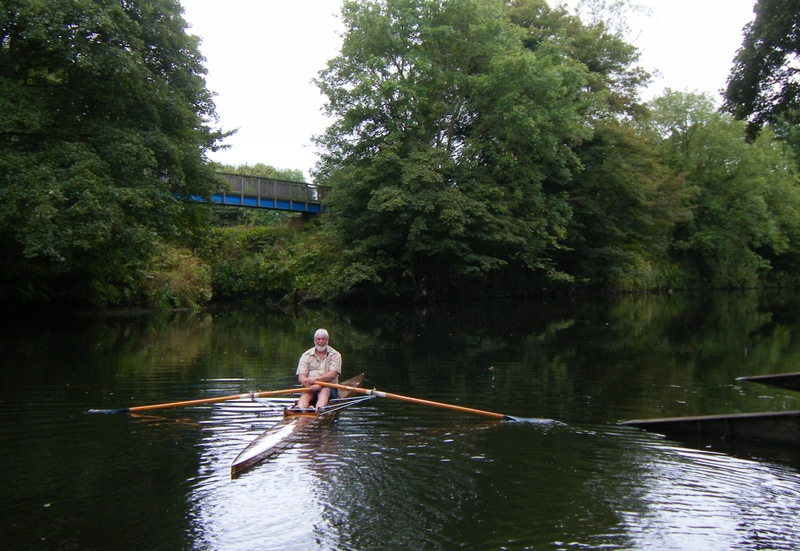 Roger was a member of Durham Amateur Rowing Club (DARC) at the time but had been an active junior member of Hexham Rowing Club in the 1960s. 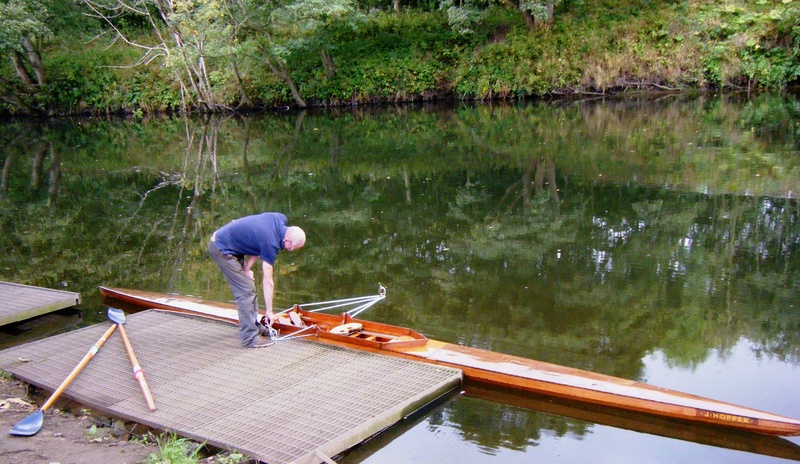 The J. Hopper was named after the eminent Hexham-based professional sculler of the 1920s and 1930s, Jack Hopper. Jack had competed against the Thames-based Bert Barry and his brother Lou in the major professional regattas of that era, and against Roger’s grandfather, Tom Bean. Hexham Rowing Club was created in November 1878 at a meeting in the North Eastern Hotel (now the Station Hotel). About 70 young men attended with promises from another 50 who intended to join. It should be remembered that this was in the heyday of professional rowing in the North East before the creation of the Football Association. For Alan Shearer read Bob Chambers. For Bobby Robson read Harry Clasper. Every stretch of water had its town rowing club: Corbridge, Ebchester, and Hexham. Every amateur club was also effectively a training ground for potential professionals who would be ‘sponsored’ by bookies and wealthy entrepreneurs as well as gentry. There were some 20 professional rowing clubs at one time on the banks of the Tyne. • Jack Dodd, who won the world renowned Tyne Christmas Handicap in 1906. • Joseph Robinson, who won the Hexham Christmas Handicap in 1912 before emigrating to Australia and making the ultimate sacrifice at Gallipoli. • Jack Hopper who competed throughout the 20’s and 30’s as a professional winning most of the major events throughout the north and further afield. He later retired and continued rowing at Hexham into his late 70s. Hexham Regatta has always been a major rowing event in the North East. Its Christmas Handicap was a significant competition in the professional calendar in the early part of the 20th century and attracted competitors from all over the British Isles. What follows is Roger’s description of his restoration of the J. Hopper but before is an explanation of how the J Hopper got from NE London to Hexam. Thanks to Roger for researching this with help from ex Hexam members and Chris Dodd and Robin Holland Martin. My information about Hexham’s purchase is via email from an ex committee member of the club, and a telephone conversation with the then-Captain (both of whom I knew personally in the early sixties). 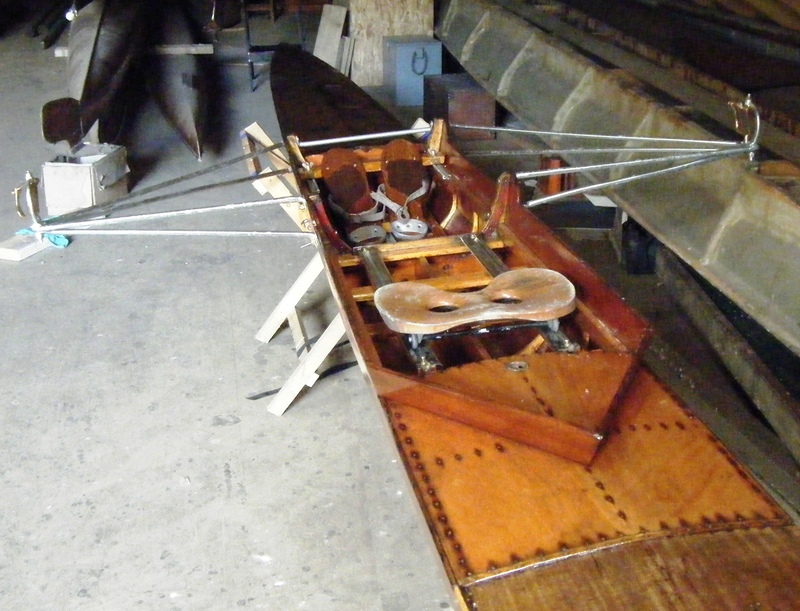 Both confirm that a pair of matched clinker scullers were bought by Hexham Boat Club (as it was then) in 1960 from a London source, and that they were described as ‘ex-Doggett’s committee boats’ and that one was named ‘Holland-Martin’, and that boat was re-named after Hexham’s most famous sculler Jack Hopper. The other boat has long disappeared, either given away to another club or more probably scrapped. 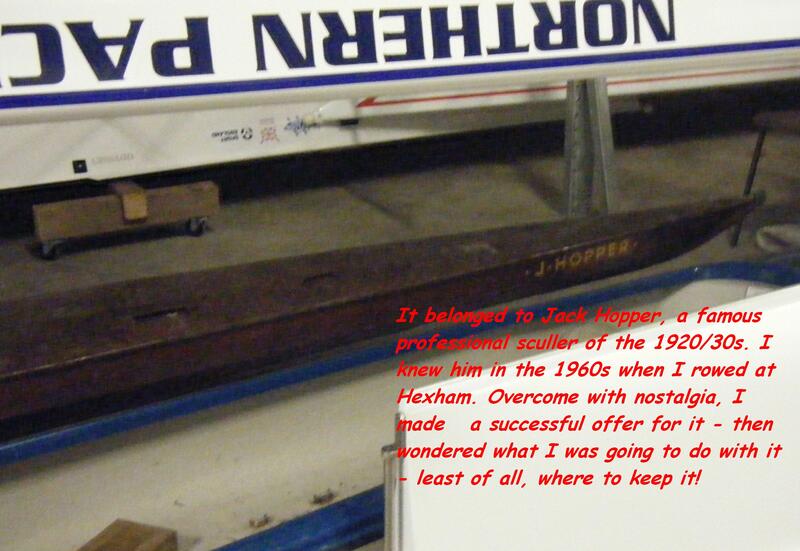 The J.Hopper only survived because of the connection with his memory, but since no one at the present Hexham Rowing Club (as it is now) has any recollection of Jack the boat was almost certainly destined for scrap. Interestingly, the deal in getting the two boats to Hexham was organised by Jack Farrow who was the flagman for Jack Hopper when he was racing in the Newcastle Handicap as a professional sculler. He reached the final in 1933? and only lost (I think to one of the Barry’s) when he hit one of the bridges. He always said that Farrow give him the wrong signal (which Farrow disputed) but we shall never know what really happened. The Hexham boat Club paper archive has, apparently gone to Australia with an emigrating ex-secretary or, more likely, been binned. When the old Hexham wooden boat shed was demolished, other Hexham Boat club papers were given for storage to Tyne Amateurs Rowing Club (now Tyne Rowing Club) (with which Hexham had a good relationship by way of Tyne loaning boats for regatta purposes etc. – as cox, I sank one of Tyne Amateurs’ shell fours in a regatta when I struck a submerged brick projecting out of a gravel bar). Apparently they were until recently on a bookshelf in the Tyne clubhouse – which was demolished earlier this year to make way for a brand new clubhouse! Chris Dodd has said that it was in 1960 that the Doggett’s race abandoned the use of the ‘committee boats’ and allowed the competitors to use their own or club shells, i.e. shell built boats in the same class but not necessarily matched. This would fit in with selling off the committee boats at that time. Committee boats are when the regatta organisers (the committee) provide the boats to the competitors. Information from a current Fishmongers Hall Member Robin Holland Martin. Whilst I am currently a Court Member, I did have an uncle who was on the Court from 1944 until he died in 1981. The boat which you have nobly rescued was undoubtedly named after him and not me (my grandfather was also on the Court but he died in 1944)! I did ask my uncle’s widow whether she remembered anything about the naming of the boat and she did not. I therefore assume that the Fishmongers’ Company paid for the six boats which were named after possibly the six Wardens of the day. In my view, having once paid for the boats the Fishmongers’ would have handed them over to the Watermen’s Company and would not have been involved in the re-sale of any of them to the Hexham Boat Club. 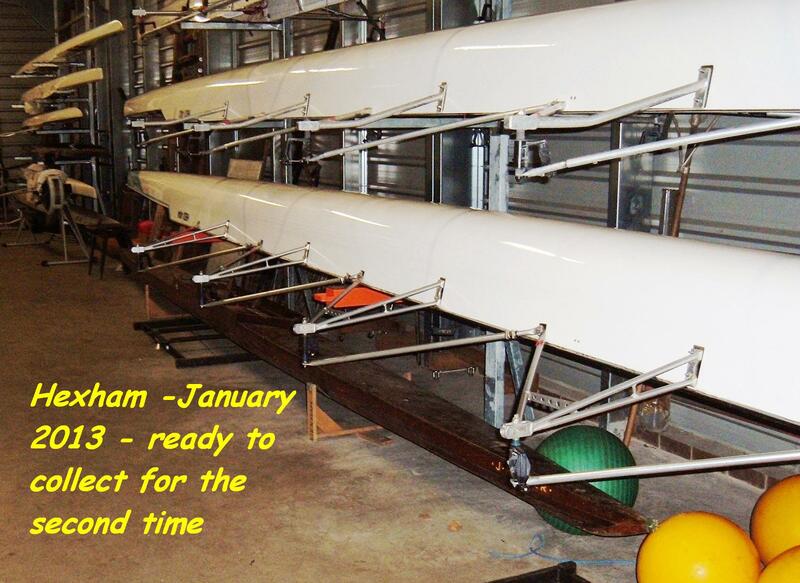 “I returned to rowing in 2012 after a 32-year ‘pause’, joining my local club at Durham. 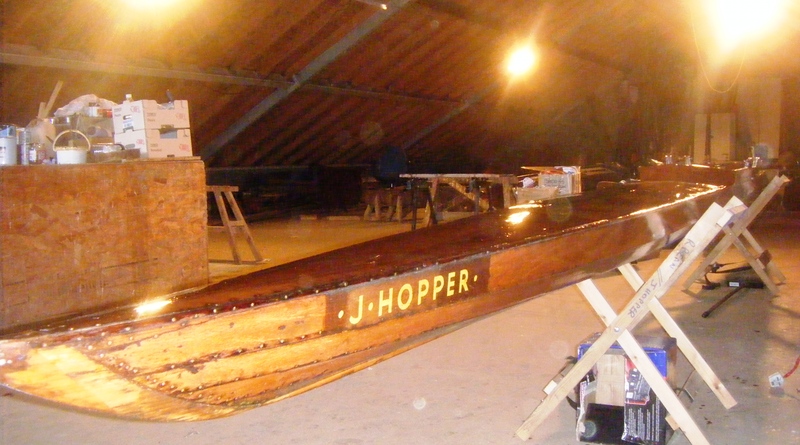 In October of that year, while visiting Hexham, where I rowed from 1959, I noticed lying on the floor, a dilapidated clinker sculling boat bearing the name J. Hopper. I remembered Jack Hopper, he and my grandfather used to reminisce about the ‘old days’ when they had competed against each other in the ’20s and ’30s. 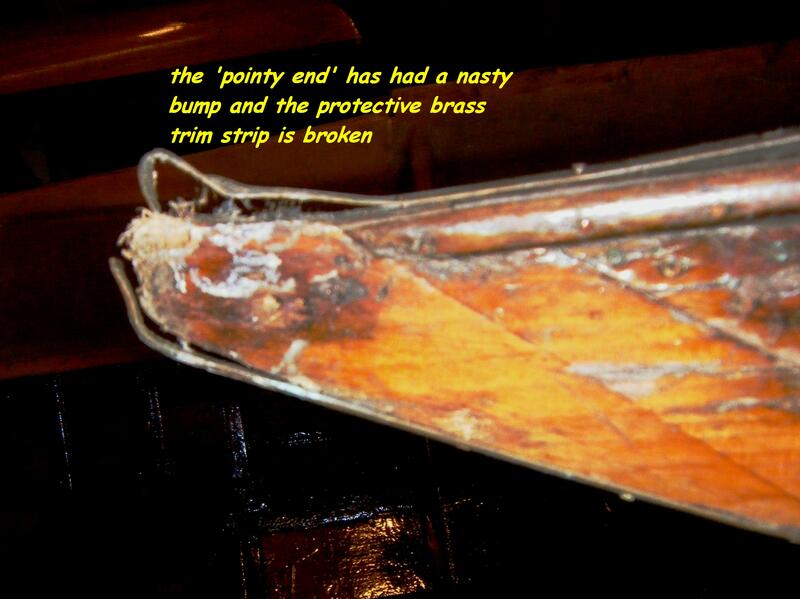 The boat was minus its riggers and seat, and much of its varnish had peeled away. 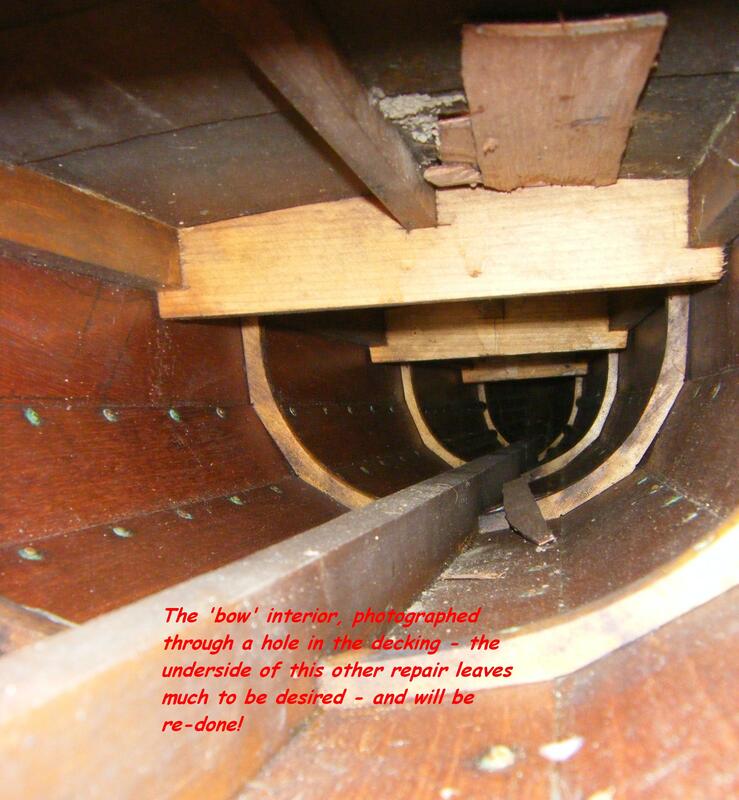 There were four holes in the thin ply bow and stern covers, three of which had been previously repaired (badly) and broken open again. 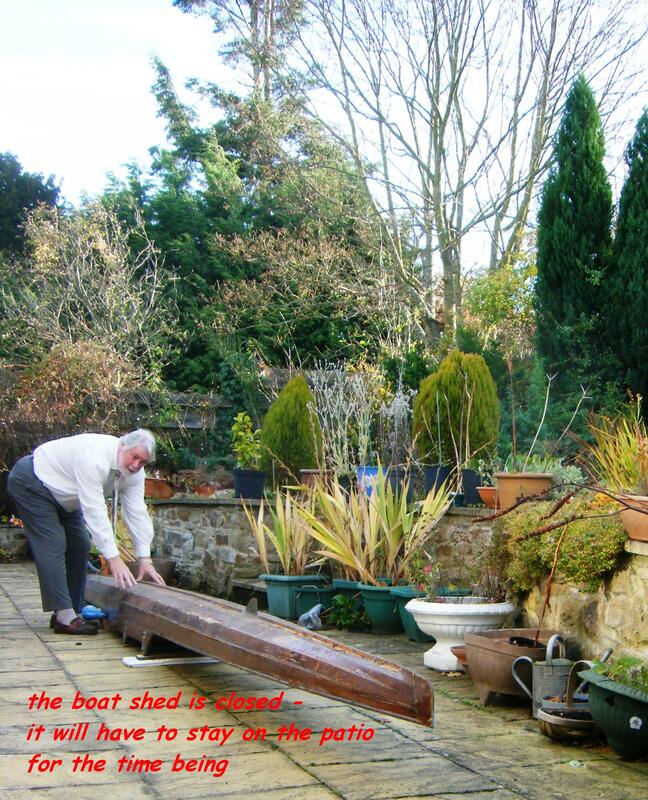 I remembered it in the old wooden boatshed – we juniors were not allowed to use it although we learned in similar boats. Last time I saw it was around 1990, slung in the apex of the roof of the old shed, kept only in memory of Jack, who had passed away a decade earlier. “Seeing it lying there, almost certainly destined for a bonfire, I suddenly got all nostalgic and offered £50 for it. ‘Accepted!’ said the Captain. “Oh Lord! What had I done? I had not considered where to put (hide) it, what it might cost to renovate (‘restore’ is too grand a word for what I intended) or worse – what my wife might say! I told my father. 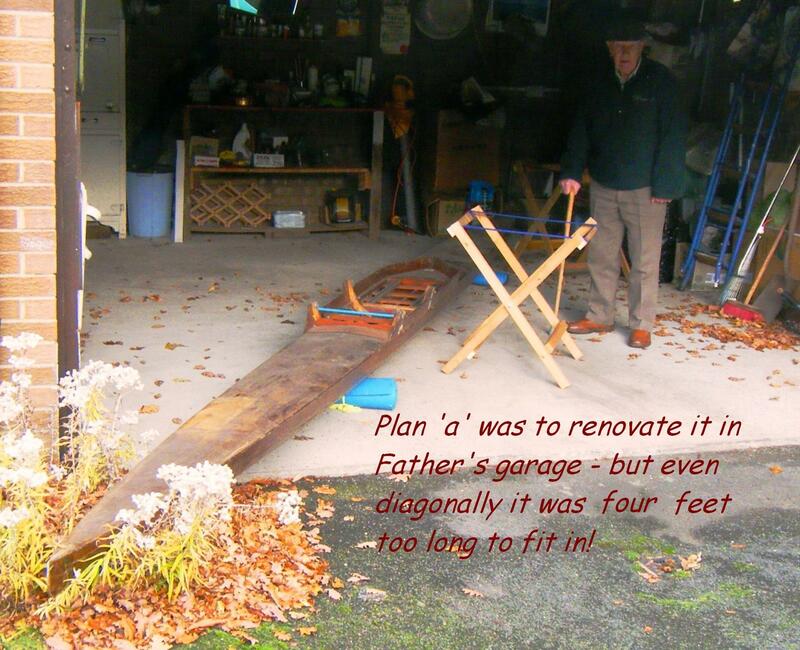 ‘Bring it here, you can use my garage,’ he said immediately, for he too remembered Jack, and liked the idea of renovating ‘his’ boat. (It turned out later that this was not Jack’s personal boat, but a club boat named after him). Never mind, I had a new project, and predictably my wife was not at all amused. “We car-topped it on camping bedrolls to father’s house where we discovered that even diagonally, at 26 feet long it was four feet too long to fit in the garage. Back to the boathouse it went while I scratched my head, while my wife thought that would be the last of it. Not so! 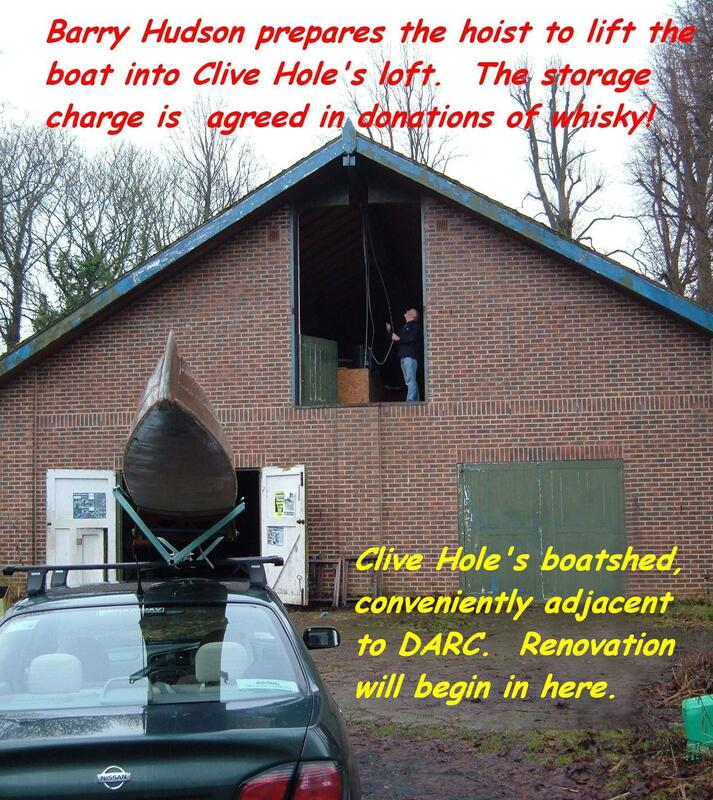 To the rescue came Clive Hole who has a huge boatshed and loft adjacent to the Rowing Club at Durham. Clive is interested in old boats and has a small collection. I could put it in his loft during renovation. When I asked about rent he turned away muttering something about bottles of whisky. 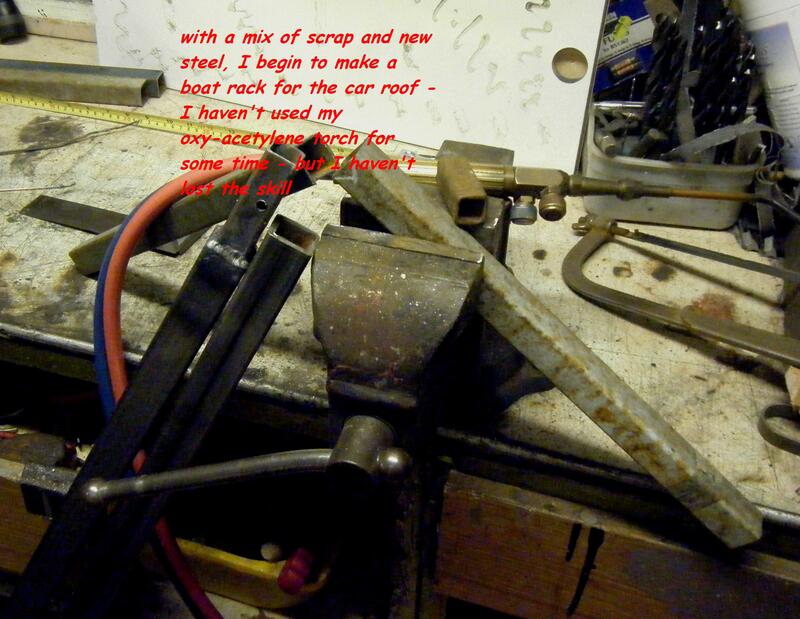 “I bought roof bars from a chap at the pub, and I have gas-welding apparatus and soon made my own car-top carrier and trestles. 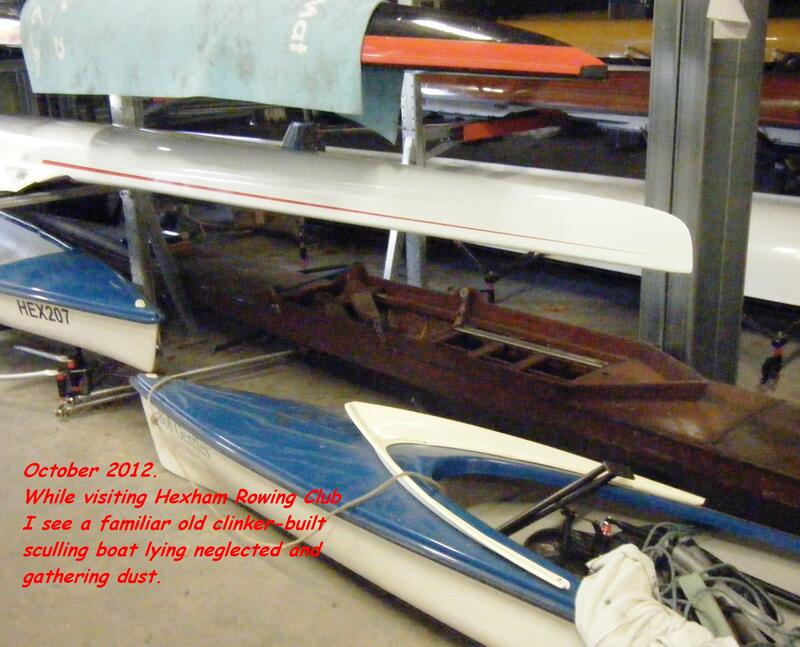 I collected the boat from Hexham again in January 2013. 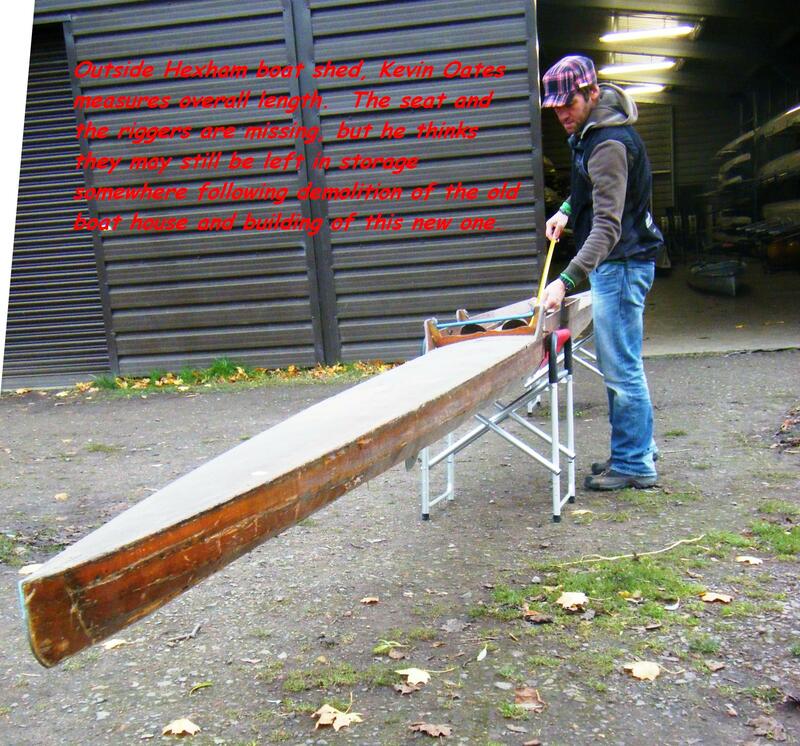 The journey to Durham was uneventful and my first port of call was at Brown’s Boat Builders, where I was advised that the boat was not commercially repairable, but Paul Lishman offered advice and use of some materials in Clive’s loft to help renovate it. 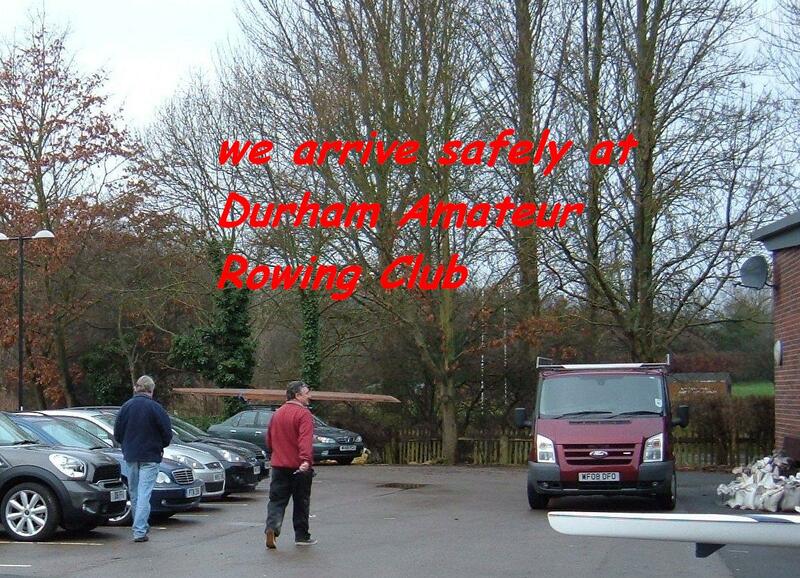 Arriving at Durham Amateur Rowing Club it was duly hoisted into the huge loft beside the fleet of Brown’s pleasure-boats wintering there. “Access to the loft is by a vertical ladder (boats go up the outside on a winch). Renovation was slow, though methodical. I found an electric heat gun and scraper most effective in removing the old varnish. Under the gun it quickly softened and curled up on the scraper, cooling to a sort of brittle praline. I filled buckets with the crispy stuff. “Meanwhile I began to research the builders of the boat, ‘Vincent Radley & Sons, Boat Builders and Marine Engineers at Springhill, Upper Clapton, London E5’ on the River Lea, and found Clive Radley, who was putting together a history of the family boatbuilders, and Chris Dodd at the Henley River & Rowing Museum, who co-incidentally was preparing an article for Rowing Magazine on – Jack Hopper! 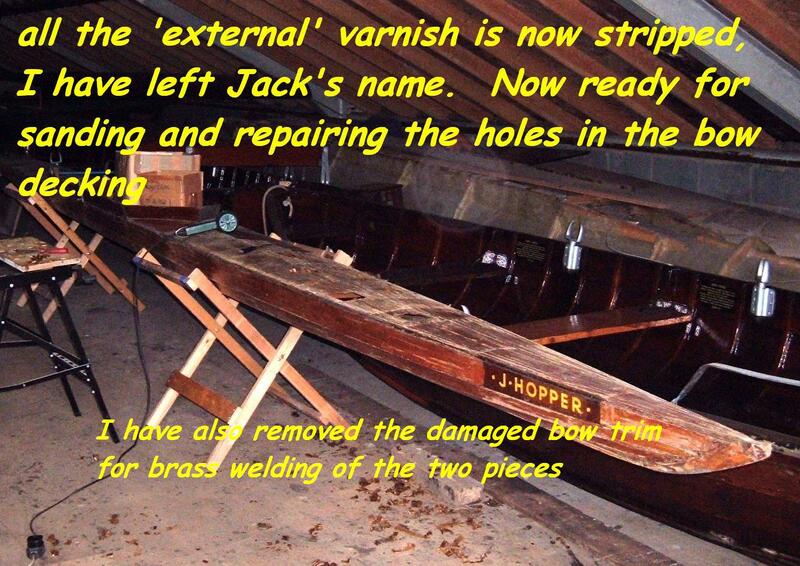 “I have known the boat since 1960 and am certain it has never been modified or repaired since then. Jack last raced at Ebchester in 1963 and certainly not in this boat. On this basis, and bearing in mind the half dozen patch/repairs to the very thin wooden covers must have been done pre 1960, then the wooden tops must be much older. “This begs the question, did the boat have timber covers as original, or was it an open topped boat, and received the wooden tops later? I’d have thought that if it had ever had canvas tops, they’d have been repaired, rather than being replaced with the wooden sheet? Have we any way of knowing whether Radley’s fitted wooden tops? “See how thin the covers are in the picture above, the shot of the square hole (I have the patch) through which I photographed the inside of the hull. The hull appears sound, and I hope that merely stripping and re-varnishing the exterior will render it watertight – I haven’t a clue how I’d re-seal the interior without removing the covers! Is there any proprietary spray I could apply through the holes? “We haven’t found the seat or the riggers – it is possible they may be in the loft of the old Tyne Green Café at Hexham, now used as a changing facility for the rowing club. When the old wooden boatshed was demolished in the 1990s, the boats were stored at local farms, but much ‘small’ equipment was stored in the redundant café. I live in hope! “I intend to refurbish the boat as it is – warts and all, preserving Jack’s name and making good the old repairs. Hopefully I will get some use out of it – but it will I suppose, eventually belong in a museum. 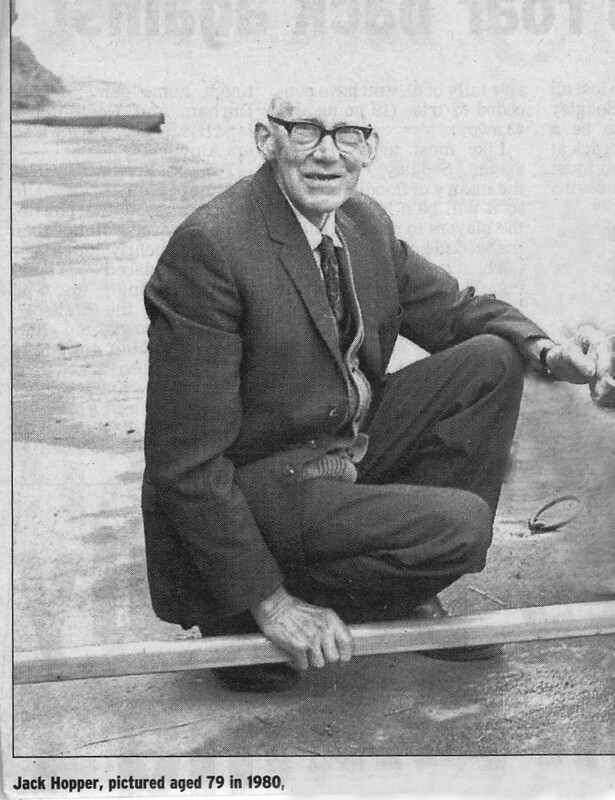 I have a 25,000-word article for the Hexham Courant written by Jack in 1978, detailing his professional sculling career, which should stay with the boat. 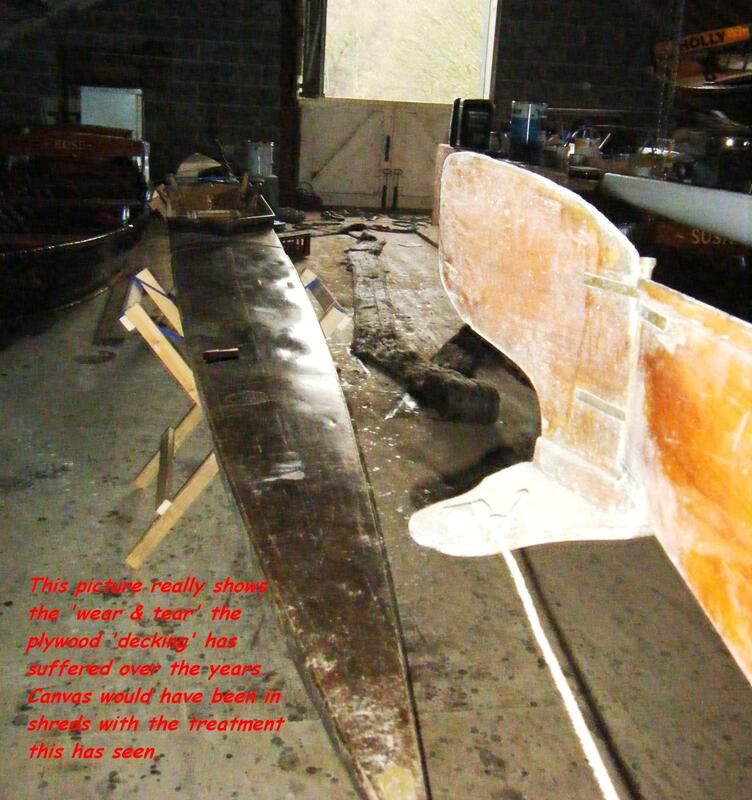 The boat has thin plywood covers and Roger asked whether this was common practice in Radley- built scullers; he assumed plywood covers were longer lasting than canvas. 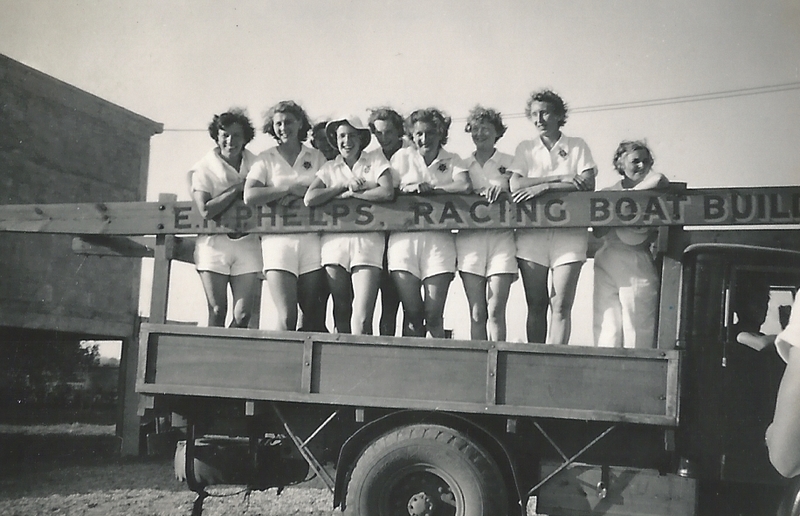 June Cann replied that a number of boats with wooden covers were built by her dad Sid from 1949 onwards. 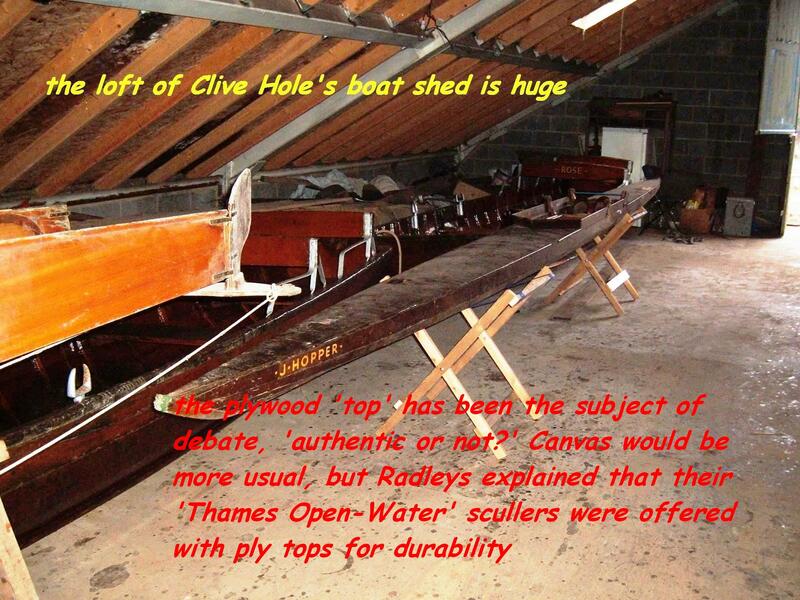 “Radley-built boats were named in the boatyard before delivery, if that’s what the customer wanted. 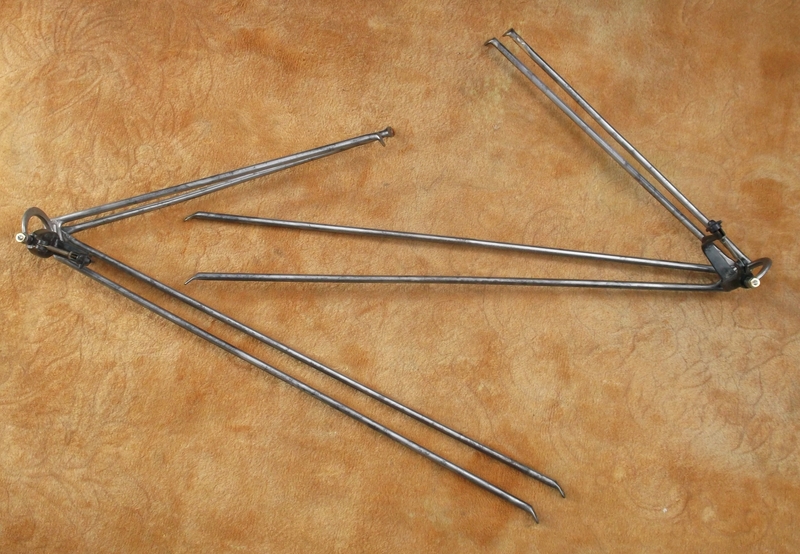 “The cross-members keep the ribs pressed outwards, and are needed no matter what the top, canvas or ply, so yes, the same number of cross-members are required. Changing the shape of the top of cross-members to support ply or canvas doesn’t change the real reason they are there: to stop the boat from folding up. The ply tops were not often fitted, because of weight considerations, and did not form part of the structural system – this was always the job of the cross-members. I don’t know how many scullers had ply tops. The one I ‘helped’ Sid build in 1969, (which we think was his last), was canvas-topped. “Speaking as a former rower, keeping riggers and foot-boards and stretchers and seats in the boats they are supposed to be in just doesn’t happen – the parts are interchangeable, even though the boats were hand built. There are exceptions of course, particularly in builds intended for ladies, like the one we have here in Hong Kong, but by and large that kind of thing is standard. “I then put a plea in Rowing Magazine for suitable riggers, and Ian Marriott in Oxford offered a pair of early Matt Wood items with bronze gates. I stripped the old paint off, welded a couple of holes and had them zinc plated. The brass bow-trim strip was broken following a nasty bump and I straightened it and neatly brazed the two parts together. “Eventually all the old varnish was off, I repaired the holes in the covers and began the tedious job of sanding it. This was done mostly by hand, as the electric sander was the wrong profile for the clinker ‘planks’ and no use inside the complex ‘cockpit’ I gave it two coats of modern marine varnish, and it looked good. I’d been told that finding a seat wasn’t a problem; there were cupboards full of them ‘saved’ from scrapped boats. I soon found some with ‘fixed’ axles and by shortening and re-threading a pair of axles, making new ‘retainers’ to keep the trolley on the runners and fitting a seat top to suit my particular backside, I had a complete boat by late August 2014. I had also had a good rummage among the assortment of old oars in the darkest corner of the loft and found a lovely pair of ‘spoons’ with hollow wooden looms and early plastic collars and buttons which suited the old brass gates nicely. I would ask Clive Hole about them. I told Clive Hole of my progress and asked his help in setting up the riggers. “We’ll do it on Monday” he said. So after the morning rowing on Monday September 1st 2014 we climbed into the loft and after half an hour of tweaking and tapping and sighting by eye, Clive reckoned it was time to put it on the water. I wasn’t quite prepared for this. ‘What about sculls?’ I asked, and showed him the pair I’d found. ‘Oh, I think I know whose these are, they haven’t been used for fifteen years, I’ll enquire about them for you.’ ‘Then how are we to get the boat downstairs?’ I asked. The loft floor is a good 10 feet above ground. ‘Oh, easy. You go down and I’ll slide it out and tilt it down to you,’ he said, and he did. “Down below, I took hold of the bow as Clive tilted the boat over the sill, cushioned on an old lifejacket, and slid it out until the stern was just resting six inches over the sill. I had an inch of water in the cockpit so I came in, satisfied that I wasn’t far off completion. 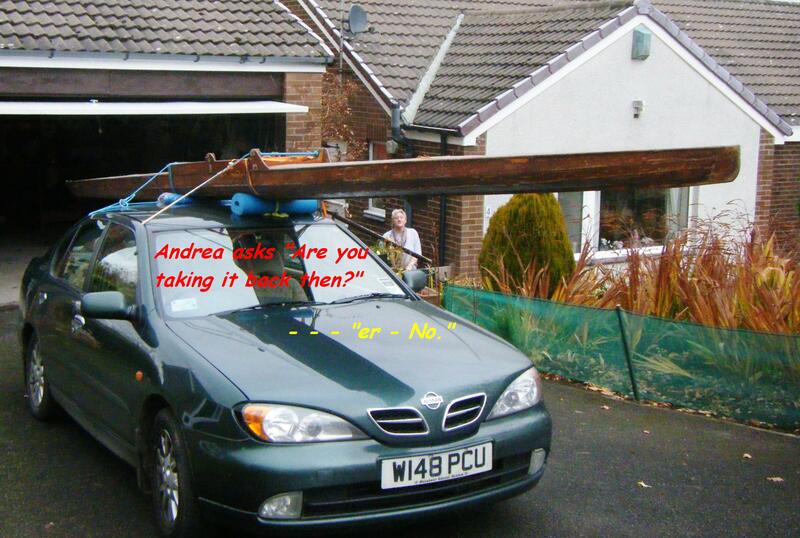 However, when we tried to lift the boat off the water it had gained weight. The stern section must have drawn at least three gallons! We struggled to hold it up, turning and tipping it while it drained. 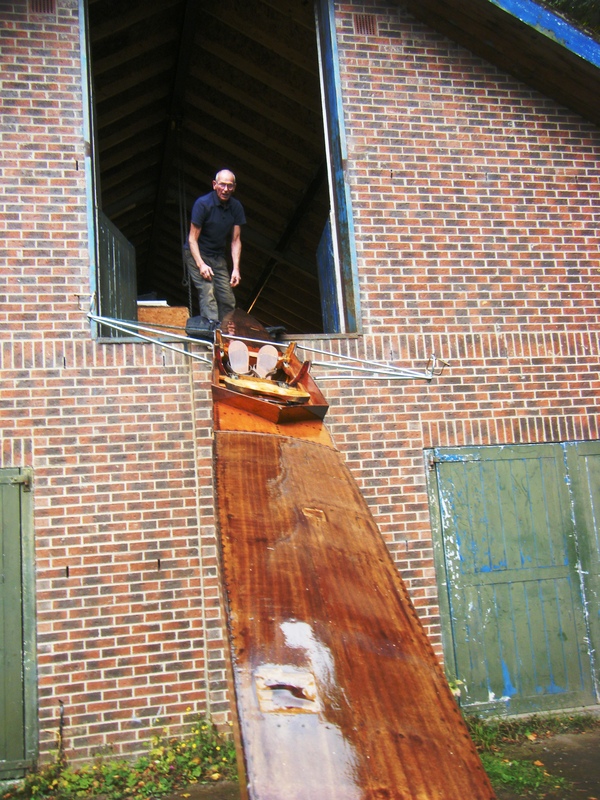 Clive remained optimistic as we put it away on its trestles, this time on the ground floor (the fleet of pleasure- boats was due back upstairs and extra space would be required for their overhauling). Since then Roger has moved house to Kidderminster and repaired the leaks before he moved. 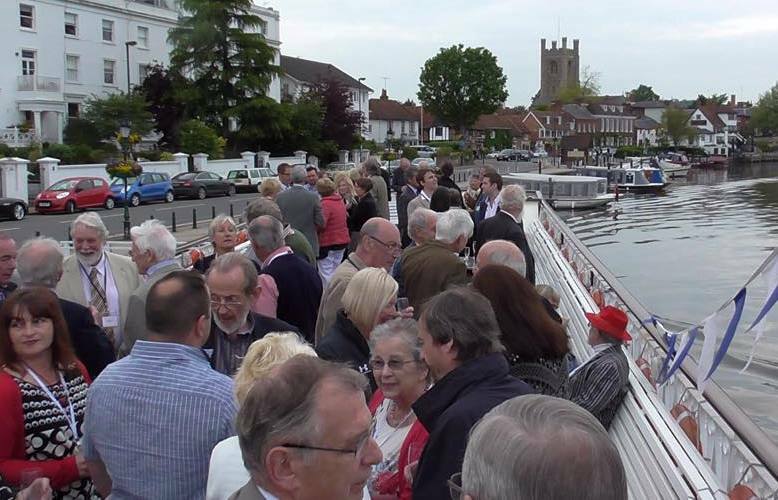 In May 2015 I held a 70th Birthday party on the New Orleans Hobbs boat at Henley and we had an evening cruise. Roger and his wife and Chris Dodd came and we all had a merry time. 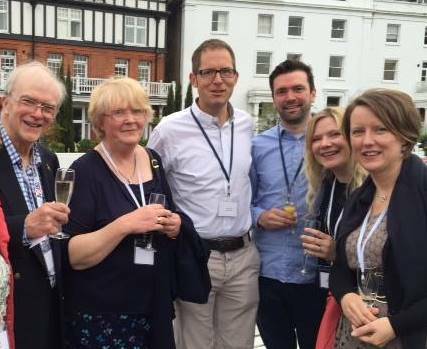 Tom Boyde and Janet Szajer (Laurie Radleys daughter), also came and my cousins from the USA: Vincent, Roger and Robin. Vincent has a Sid Radley sculler on the wall at his house. Roger Bean, left with white beard, Chris Dodd to his right. Janet Szajer with glasses, middle bottom and Tom Boyde glasses and beard talking to Janet’s son Tony Szajer. Tom Boyde was the husband of Sid’s daughter Shirley and has a Radley sculler at Thames rowing club. Clive at Pangbourne a few years before I was 70. 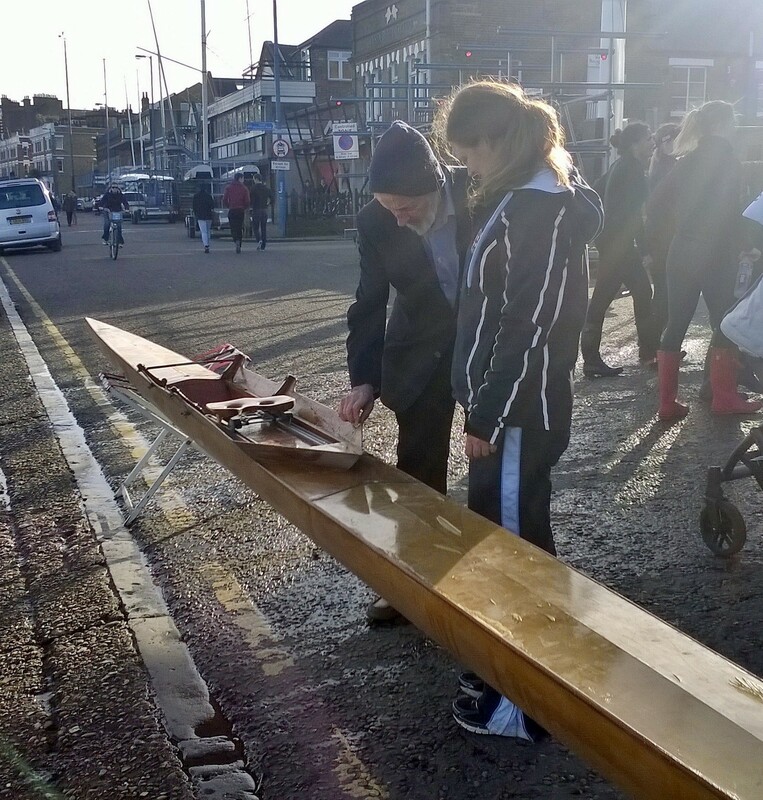 Laurie Radley’s Memories of River Lea and UK Rowing and Boatbuilding, in the early 1900s to World War II.